Clinton, Michigan - Eden Organic Black Beans, Eden Organic Spicy Refried Black Beans, and Eden Organic Pumpkin Seeds were selected by Men's Health magazine in "The 125 Best Foods for Men" annual feature of the November 2010 issue. This is the fifth time Eden Foods has been similarly honored by Men's Health. 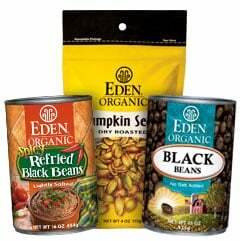 Eden Black Beans received the honor as the "Best Canned Beans", Eden Spicy Refried Black Beans were chosen as the "Best Refried Beans", and Eden Pumpkin Seeds as the "Best Nut Alternative". Men's Health said of Eden Black Beans, "Simmer these antioxidant-rich beans with sautéed onions and peppers for an easy side;" of Eden Spicy Refried Beans, "These spicy beans pack in big flavor, and despite the "refried part," only a bit of fat;" and of Eden Pumpkin Seeds, "A high protein snack equally suited to the ballpark and the office." Men's Health wrote of their best foods for men list, "Add these brand-name all-stars to your grocery list. They'll help you fight fat, keep fit, stay healthy - and make your taste buds happy. Stop the grocery guesswork. With this shopping list in hand, you won't need to scan labels or compare brands. We've sampled, tested, and rated hundreds of products to find the healthiest, tastiest foods for men. Stock your cart with these picks and you're halfway to the body you want." Eden Organic Black Beans and Spicy Refried Black Beans are U.S.A. family farm organically grown, fiber rich, and a good source of protein, iron, and magnesium. Eden Black Beans are low fat and low sodium with no salt added. Eden Spicy Refried Black Beans are low fat with no added fat, and have half the sodium of other brands with zero additives or preservatives. Eden brand is the only canned bean using bisphenol-A (BPA) free enamel lined cans, and they are kosher. Eden Organic Pumpkin Seeds are a delicious snack that are dry roasted with a touch of Eden Sea Salt and still low sodium. Rich in fiber, protein, and magnesium, and a good source of iron and zinc. Cholesterol free with zero trans fats, a great food for parties, travel, camping, backpacking, and nutritious snacking. Sprinkle on salads, pasta, vegetables, and soups for a healthy enhancement. No refined salt, added oil, additives, or preservatives. Packaged in handy, protective, reclosable 4 ounce pouches. kosher.